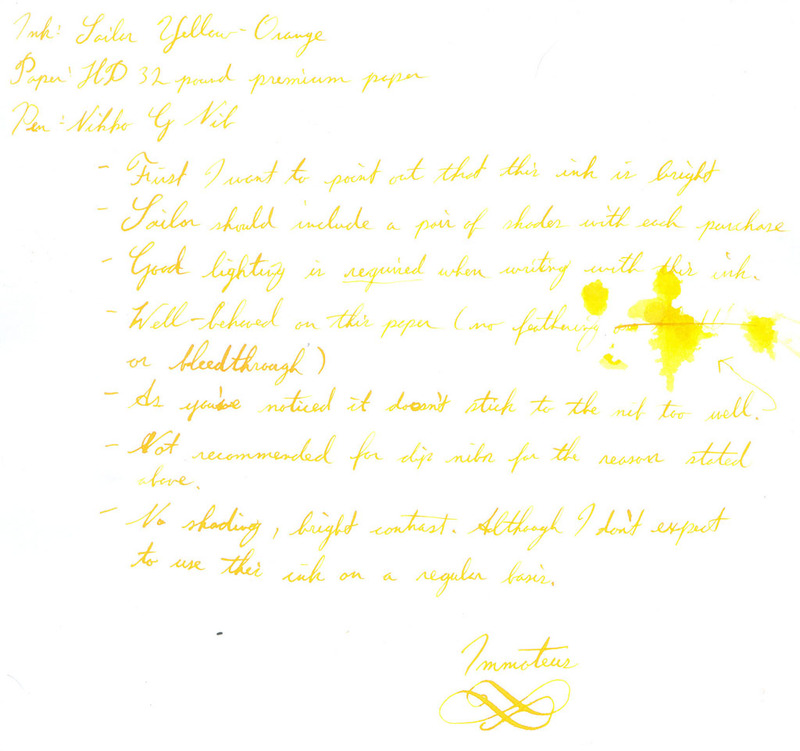 Attached below is a handwritten review of Sailor Yellow Orange. Enjoy! Edited by Immoteus, 25 December 2007 - 06:20. After this you have NO excuse. Get those girly colors out! is this ink like noodlers firefly? Could one use it for highlighting in a broad nib? Do you have a regular use for it? Edited by MiniMaupassant, 12 June 2009 - 08:13.
well the colour is so beautiful and as i regularly use a highlighter this could be a cool use for it and then occasionally writing beautiful letters wiith it. i wonder if one could see it if one wrote with it on darker paper? I find it to be a surprisingly useable colour, - there is really quite a high contrast between the ink and the paper, although not so much when used under tungsten lighting. If you enjoy using orange inks, then a rich yellow like this might be worth considering. I've got it in my Pelikan M205 at the moment, and it looks lovely sloshing about! Then again, if you want to do any mixing with Sailor inks, Yellow Orange would be a good investment, as I understand they don't play well with others. I have this loaded in my Edison Herald at the moment. I use it for highlighting and marking documents I am reviewing, for which purpose it works quite well. wow i just got this ink and it is really beautiful. exactly as one would imagine a nice yellowy-golden ink! and you can read it easily! Is Sailor yellow orange similar to Iroshizuku's yu-yake? I think Yu-Yake is a bit more orange, but it's not too far off. wow that's bright! Thanks for the review. I use both this and PR Buttercup, which is very similar, in my journals. I don't have any problems reading it. My husband, on the other hand, thinks it's terrible.